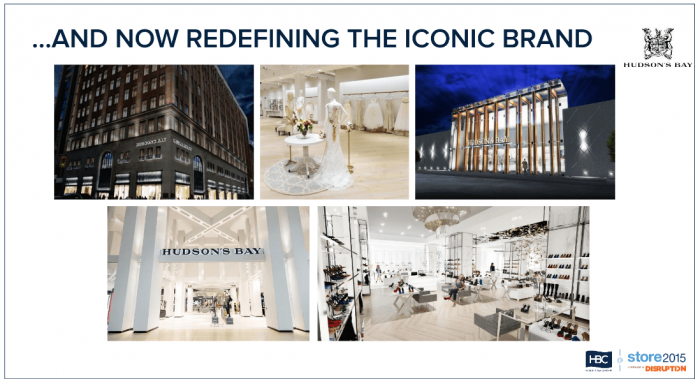 Update, December 9, 2016: Hudson’s Bay Co suffers three straight quarters of loss, CEO Jerry Storch amends his position on ecommerce and omni-channel retail. Read more here. In early June, VL was at STORE 2015 as both an exhibitor and occasional session attendee, when we could slip away. We attended a talk by Samsung and Infusion, another one centered around retail without boundaries, and yet another one hosted by Forrester Research on ecommerce trends. There was some awesome content. One of the talks making the most waves during STORE 2015 was the opening keynote presentation by Jerry Storch, CEO of the Hudson’s Bay Company. This talk was billed as a discussion about “the past, present, and future of retailing in the All-Channel age”, but his presentation had a space tone to it (aka Star Wars marries Star Trek) and turned into a time machine that took the entire main session hall at STORE 2015 back to the 1990’s. You are probably asking what are we talking about? So here was the issue as everybody saw it, Storch’s talk went against all industry trends, analytics, and predictions: Storch claimed that selling online isn’t profitable and sustainable, and all ecommerce businesses need bricks-and-mortar stores for a successful all-channel future. He claimed that internet retailing cost 3 X times more that bricks and mortar. Wow! Read on as VL breaks down why we disagree with Storch, and why opinions like this are not helpful to the Canadian digital economy. There is irony in Storch’s position. Business-centric instead of consumer-centric, Storch bucks all trends as he touted The Bay’s bricks-and-mortar centric model as near perfect at STORE2015. The problem is its not near perfect, far from it. You can scroll through the presentation here. While VL wasn’t able to listen to all of Storch’s talk in person, the wave of feedback we heard from those who did was all unanimous: Storch kept expounding that the 90 stores The Bay has across Canada, the service, the selection, and how well they were doing without a truly omni-channel presence was an example of sound retail strategy. A few weeks ago, I was late in buying a birthday present. Late, as in I didn’t leave myself enough time to buy something online from a store I really wanted to purchase from. The problem with shipping to Canada strikes again. I had to buy something I could have in my hands immediately – in other words, I had few options left to me other than having to go to the local mall. Here Storch is right, bricks and mortar is the saviour of the last minute procrastinator. Not wanting to spend more than 30 minutes of my precious evening shopping time, I thought I could put together a game plan: research the item I wanted online on the The Bay’s estore, and find where it would be in the bricks and mortar store, thus allowing me to quickly get in and out. I zeroed in on The Bay because it was the higher-end retailer that I thought would be likely to carry the item I had in mind, and also for its proximity to a parking lot that usually had spots available in the mist of this particular mall’s extensive renovations. So far so good. Assumptions all line up! The Bay’s mobile ecommerce store foreshadowed the rest of my experience with HBC. 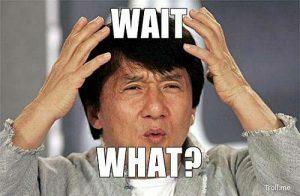 No matter the combinations of words describing the item I wanted I put into their search bar, I somehow managed to return the wrong search results every single time. This, perhaps, should be taken as a sign of failure in the omni-channel (or “all-channel”, as Storch puts it) world: if I searched for “shaving kit” and got search results on bedding products, maybe the omni-channel presence needs some fine tuning. Never saw anyone shave in bed! Have you? So the first search didn’t produce any useful or meaningful results. Arriving at the store, I was greeted by construction. I think the sales associates might have fallen under this purview, as I could not find even one that was willing to assist me in my ill-fated hunt. So much for the notion of service. Nor could I find the product I was looking for. So another blow to the bricks and mortar store model and choice. No service and no selection really means no experience. HBC had three strikes against them at this point. In the end, I quickly got fed up with the entire experience. I returned to the parking lot and accepted my fate of late shipping, and ended up ordering the gift online from Amazon anyways. So no additional sale, no reason to go back, just pure frustration. What a great experience! Storch, quite simply put, is living in a comfortable alternate reality that most retailers don’t have access to. 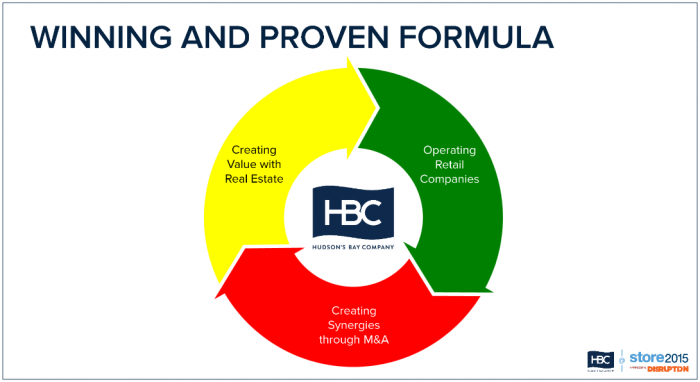 HBC and The Bay are household names with established stores across the country and a huge portfolio of valuable real estate in great locations. The Bay was around before ecommerce became big and before the computer even existed. They are, simply put, the oldest continuous enterprise in the English speaking world. They were chartered in 1670 by King Charles I, So maybe they can afford their delusions of emphasizing “creating value with real estate” while leaving poor internet natives like myself high and dry when we try to shop at The Bay in the ways that we’re used to with other truly omni-channel retailers, for how much longer can The Bay can afford to do this is yet to be seen. Jerry Storch’s presentation at STORE2015: Note the emphasis on bricks-and-mortar, and the conspicuous absence of digital channels. Unfortunately Storch’s talk wasn’t recorded in full, but the slides from his presentation are available online. You can tell plainly from the slide below that Storch puts the utmost value on the sheer quantity of physical stores The Bay has across Canada, and this seemly serves as his foundation for his argument against ecommerce and omni-channel. Interestingly enough, Storch doesn’t speak to the changes happening within the supply chain as ecommerce and omni-channel retailers who sell online employ more and more drop-ship vending. Nor has he factored in the cost of the consumer getting in the car and driving to his store and then not finding a sales clerk, not finding the product and returning home empty handed having had a truly terrible experience. Some one paid for that round trip. Nor has he factored diminishing inventories retailers are carrying as they try and rationalize costs. Finally he also doesn’t factor into his calculations the changing demographics. Its just not cool to hang out at the mall any more! “So why are Internet retailers such as Amazon trying to charge consumers less than bricks-and-mortar retailers for goods? Let’s all take a pause to let that last statement really sink in. We did know that Amazon wasn’t making any money. But then maybe that’s the plan!! Its called a loss leader! The problem with Storch’s position is that he’s speaking from a comfortable and secure place: The Bay is doing well. They sell a number of middle to high-end products. They’re fairly unique in the Canadian marketplace – for now, anyways. Here’s a list of all the retailers coming to Canada in the near future: take a look at how many of them have similar retail models to The Bay, and how many of them have considerably better omni-channel presence than The Bay. The problem with Storch’s position is it’s business-centric instead of consumer-centric. Consumer-centric is the future: the entire premise behind omni-channel or what ever channel retailing is to be present in all the ways and places that consumers like to shop, and giving consumers the experience and customer service they crave. Storch even says it in his presentation. However it would seem that Storch and The Bay are throwing all this to the wind, instead telling the marketplace that consumers will shop in the ways that HBC tells them to shop. Worked well in my story above, didn’t it. But the even larger problem here is that Storch is telling other Canadian retailers to neglect online channels in favour of sticking with the traditional bricks-and-mortar model of olde. 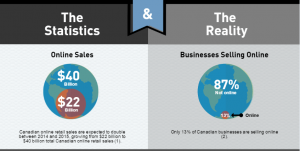 If you’re a follower of our blog, you’ll know that VL just spent a considerable amount of time through a Financial Post article, Infographic, and Webinar (which you can now watch live on-demand by clicking the button in the right-hand bar of our blog) bemoaning the sorry state of ecommerce adoption by Canadian retailers. But then we aren’t HBC so who cares right? While omni-channel, every channel, too many channel universe might not be right for every company, Storch’s opinion coming from a position of power and success could negatively impact retailers who are struggling in their bricks-and-mortar stores and looking for a difference maker like ecommerce. My question to Storch is ultimately: Why discourage other retailers from being online? What good does it do for The Bay, Canadian retailers, or the Canadian economy both online and offline? I am, to say the least, baffled by Storch’s position. Perhaps if he had chosen his words more carefully, his talk could have been constructed as why bricks-and-mortar retailers should be paying attention to the amazing experiences The Bay is constructing at some of their bricks and mortar locations for their customers, like the one below and how the brand is changing to make The Bay a destination. I still believe that Storch is making a possibly fatal misstep in not unifying this ‘live’ unique experience with an effective digital counterpart that can provide the user with a useful platform to search for ‘shaving kits’ properly the first time. But in that regard, time will tell. If you attended STORE 2015 we would love to hear your feed back and comments. Want to see how VL can help your ecommerce and omni-channel stores run better? Book a pressure-free phone call with our integration experts!